As Lu Xun said: “Marx was still able to write” The Capital “in the middle of crying children, so he was a great man …” (1). This sentence came to my mind while reading Feng Zikai’s essays (2) on which I will come back soon and reminded me that this group of friends in the region of Shanghai: Feng Zikai, Zhou Ziqing and Ye Shengtao had written about children in the years 1925, the same as Lu Xun and Lao She, the writer from Beijing. Wailing Walls: At that time, children became a subject in literature for the writers of the May 4, 1919 generation. Zhou Ziqing (1898-1948), one of the great stylists of that time, who became a classic for his prose (sanwen) written in the vernacular (baihua) (3), described the sale of a little orphan, “they bought your life for seven maos, poor child! Has human life such a low price? Then I started thinking about the fate of my children and I was terrified “(1924). Similarly, if education and its reform was a key topic of debate, intellectuals like Lu Xun and his brother Zhou Zuoren, complained that China had no real children’s literature. 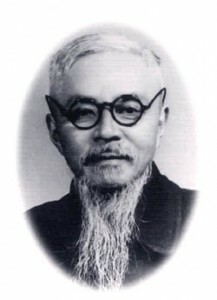 As a teacher and writer, Ye Shengtao (1894-1988) will start to write and publish the first fairy tales. For Zhu Ziqing it is even worse; ” at our place, all day long, it is a real battlefield … so I wrote a letter to Shengtao, I told him that the agony inflicted by my children and the situation being hopeless, I came to ask myself -it’s hard to believe- if I was not going to kill myself …. ” He did not do it, but this did not stop him: six children with his first wife and three with the second! “A happy marriage” as seen by Lu Xun in 1924: He wrote a short story about a character who fails to write a short story. His hero wrote about a couple of intellectuals, living carefree lives and with the “snobbery” of Western references, while the hero is faced with the hassle of daily life and his children. Lu Xun’s tone is acid and brings the reader back to the reality of injustice. Zu Ziqing and Feng Zikai are not really involved in social struggles; as for Ye Shengtao, he has not the talent of Lu Xun for composition and conclusion of a short story. Lao She went further, he wrote in Singapore in 1929 a children’s book “The anniversary of Xiaopo” (5), then a play “The magic boat” (ELE 1982). Feng Zikai had the nostalgia of his youth in his hometown of Shimenwan; he had lost the innocence and simplicity of childhood and his own children have reinforced this sense of loss. Geremie Barme, professor at the University of Canberra, shows in a remarkable book (6), the links between drawings (which made Feng Zikai famous) and essays. Feng creates in his drawings, a world viewed through the eyes of a child, he even dedicated a collection of drawings to the theme of childhood. Drawings that we cannot forget: the child in the arms of his mother who stretches his hands toward the moon: “I want it! ” Zhanzhan, his son, with a bicycle the wheels of which are lotus leaves. For Feng, the children are not a continuation of the parents, they belong to a totally different world. His interest is limited to his own children and declines rapidly when they become older; the more reasonable relationship with them will then be that of friendship. All this is far from the social struggles and the friends of Lu Xun will remind him that, the same goes with the attacks that he will suffer during the Cultural Revolution. (1) “Errances” by Lu Xun, translated and introduced by Sebastian Veg. Editions de la Rue d’Ulm. 2004. (2) “Couleur de nuage” by Feng Zikai, translated and introduced by Marie Laureillard Wendland. Bleu de Chine/Gallimard. 2010. 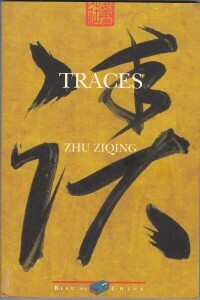 (3) “Traces” by Zhu Ziqing, translated by Lise Schmitt. Bleu de Chine. 1998. 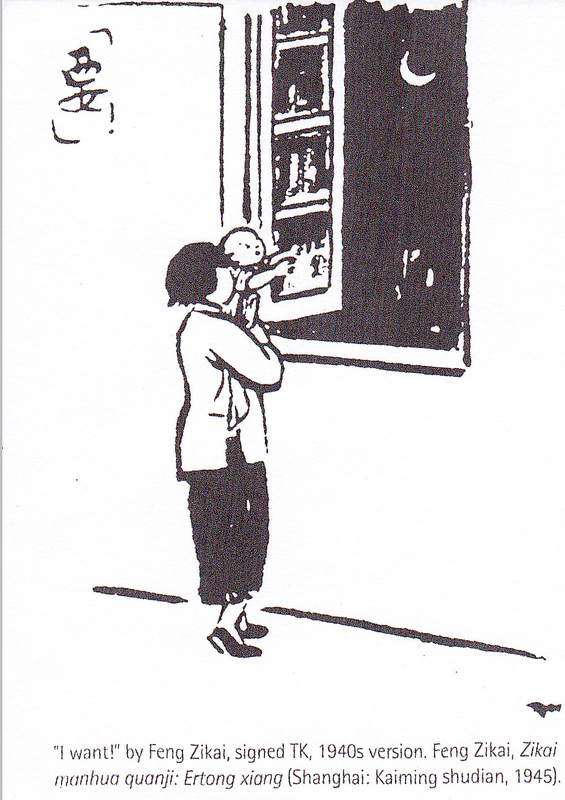 (4) “Ecrits de la maison des Rats” by Lao She. Translated by Claude Payen. P. Picquier 2010. (5) “L’anniversaire de Xiaopo” by Lao She, translated by Claude Payen. You Feng 1999 (with on the cover a drawing of Feng Zikai! ).